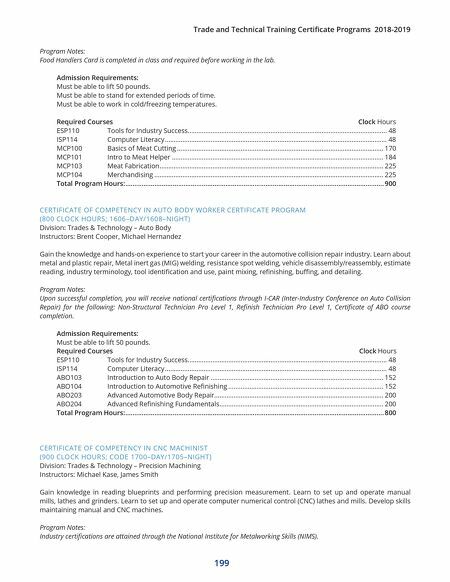 200 Trade and Technical Training Certificate Programs 2018-2019 Industry certifications are attained through the National Institute for Metalworking Skills (NIMS). Required Courses Clock Hours ESP110 Tools for Industry Success ................................................................................................................. 48 ISP118 Computer Literacy .............................................................................................................................. 48 MTO106 Machining Fundamentals and Geometric Dimensioning & Tolerancing ................................... 144 MTO107 Bench Work and Layout and Drill Press ........................................................................................ 102 MTO119 Manual Mill Operations ................................................................................................................... 108 MTO121 Manual Lathe Operations ................................................................................................................ 150 MTO132 Milling CNC ........................................................................................................................................ 150 MTO140 Turning CNC ...................................................................................................................................... 150 Total Program Hours: ..............................................................................................................................................900 CERTIFICATE OF COMPETENCY IN COMPUTER SUPPORT SPECIALIST CERTIFICATE PROGRAM (800 CLOCK HOURS; 1161–DAY/1163–NIGHT) Division: Trades & Technology – Computer Support Instructors: Adefemi (Femi) Allen, Michael Lopez Build the skills to support desktop computers, printers, mobile devices, networks, popular applications and operating systems. Learn how to provide end users with solutions for technical problems and companies with the technical tools necessary to conduct business in today's high-tech business environment. Prepare to take the CompTIA A + Certification Exam, the industry standard certifications for entry-level positions, which also provides a solid foundation for advanced technical certifications. 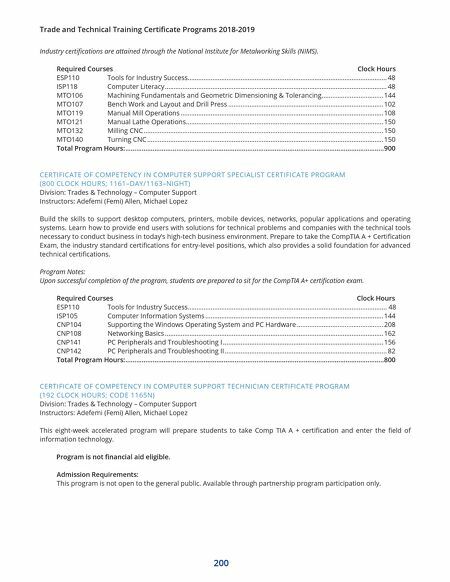 Program Notes: Upon successful completion of the program, students are prepared to sit for the CompTIA A+ certification exam. Required Courses Clock Hours ESP110 Tools for Industry Success ................................................................................................................. 48 ISP105 Computer Information Systems ..................................................................................................... 144 CNP104 Supporting the Windows Operating System and PC Hardware ................................................. 208 CNP108 Networking Basics ............................................................................................................................ 162 CNP141 PC Peripherals and Troubleshooting I ........................................................................................... 156 CNP142 PC Peripherals and Troubleshooting II ............................................................................................ 82 Total Program Hours: ..............................................................................................................................................800 CERTIFICATE OF COMPETENCY IN COMPUTER SUPPORT TECHNICIAN CERTIFICATE PROGRAM (192 CLOCK HOURS; CODE 1165N) Division: Trades & Technology – Computer Support Instructors: Adefemi (Femi) Allen, Michael Lopez This eight-week accelerated program will prepare students to take Comp TIA A + certification and enter the field of information technology. Program is not financial aid eligible. Admission Requirements: This program is not open to the general public. Available through partnership program participation only.